Don't let the beautiful beaches of Rio fool you--these games are deadly. Two years ago Jack Morgan--the head of the renowned worldwide investigation firm Private--was in charge of security for the World Cup. During the championship match, the action nearly spilled from the field into the stands. Fortunately, Jack and his Private team averted disaster on soccer's biggest stage. Now he has returned to Rio to secure the Olympics. But before the torch is lit, the threats come fast and furious when Jack discovers that someone in Brazil will stop at nothing to sabotage the games. 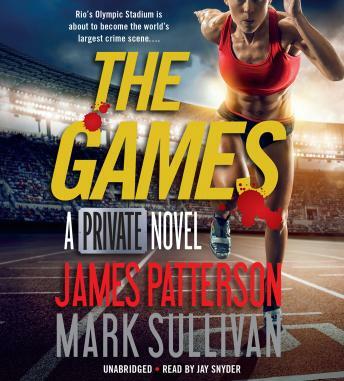 As the opening ceremonies near, Jack must sprint to the finish line to defuse a lethal plot set in motion during the World Cup that could decimate Rio, and turn the Olympics from a worldwide celebration into a deadly spectacle. Patterson does it again. What research into the Olympics and Rio! Good reading a lot of plot twists and turns James Patterson really goes in depth on how he portrays the characters in the story.